Fluorite, formerly called fluorspar, is a member of the halide mineral group. Fluorite is allochromatic, meaning that it can be tinted with natural impurities. Fluorite comes in a wide range of colors and has consequently been dubbed "The most colorful mineral in the world". Every color of the rainbow in various shades are possible. The most common colors are purple, blue, green, yellow or colorless. Less common colors are pink, red, white, brown, and black. Color zoning or banding of multiple colors is common. 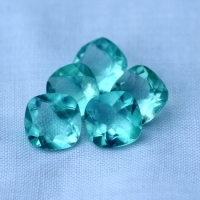 Fluorite has limited use as a gemstone for jewelry because it is relatively soft and therefore easily scratched. Despite its fragility and perfect octahedral cleavage, stones are faceted, usually for collectors, and can be polished very brightly. Fluorite has been used by man for centuries. The ancient Egyptians used fluorite in statues and to carve scarabs, and the Chinese have used it in carvings for more than 300 years. In the 18th century, fluorite was powdered in water to relieve the symptoms of kidney disease. Fluorite is a popular stone among energy healers, fluorite can also clear the aura of mucky energies. Fluorite is believed to heighten mental abilities, assisting in rapid organization and processing of information and can bring mental clarity and stability to a chaotic situation. The name fluorite is said to be derived from the Latin word for flow. 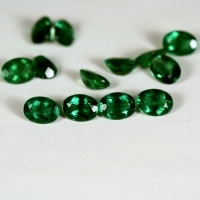 fine grade natural gemstones from Afghanistan. 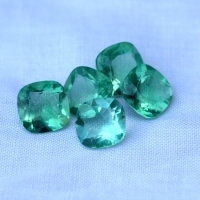 Rare fine grade natural emerald green fluorite from Namibia.